CM Magazine:24 Days in Brooks. Dana Inkster (Writer & Director). Bonnie Thompson (Producer). Derek Mazur & Gradon McCrea (Executive Producers). 42 min., 02 sec., DVD, $99.95. Order Number: 153C 9107 299. 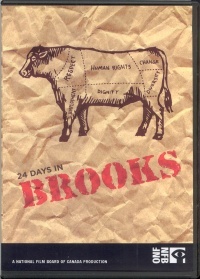 Written by a director sympathetic to new immigrants, 24 Days in Brooks is a well-constructed, impactful story about the first-ever strike at the largest meatpacking plant in Canada. This DVD could be viewed as a motivational film for getting a union established at the factory-workplace. However, it would also suit a Grade 8, 9 or 10 History or Social Sciences curriculum unit on labour strikes. A teacher and class studying cultural diversity and immigration or human rights and social justice issues in Canada in the new millennium would also profit from seeing it. I see this film as a very sensitive, decidedly pro-union, look at the conditions and people that brought about a union drive in 2005 at the slaughterhouse and meatpacking plant called Lakeside Packers in Brooks, AB. The director showed interviews with a selection of immigrant workers, many of whom had been extremely well-educated in their homelands. Numerous mentions were made of workers' family issues via using photographs of immigrant workers' children. One family-man in particular was a French-speaking diplomat whose job was to pick out bone fragments from the raw meat on the assembly-line. Two of the interviewed workers were women. Of particular note – regarding workers' health and safety concerns – were the cautious comments of the plant physician who was originally from South Africa. A lone company boss gave voice to management's point of view. Other interviews ranged from the mayor to the union president from United Food and Commercial Workers Union Local 401 to some local workers. A few were shown who were being very vocally anti-union, though this was not the case of all workers. Picket-line conditions included a few scenes where racist comments were being directed at the picketers. A teacher would be able to expand on several tangential issues which arise in this film. For example, several questions loom large: why would some workers ever oppose the establishment of unions at the workplace? Why do management personnel in general tend to oppose labour unions, and what is it that unions do or provide for injured workers who require sick-leave and monetary benefits until they are able to resume work? Other questions come to mind: how might the director have shown a more management-favourable story? Do you think that would have told the story accurately? Why or why not? How could workers' concerns be addressed by the employer other than by a union coming into a workplace? Has this ever been done with good results from labour's point of view? From management's point of view? What did the union boss mean by repeatedly saying that there is no colour on this picket? Why were so many workers hired by the employer from distant lands for this kind of work, do you think? Why, in general, does Canada need to keep its immigration levels high? What changes might come about at the federal level of government to our immigration intake levels? How do you feel about the way race issues were handled in this film? How does your favorite newspaper handle stories about labour strikes in its pages? How, at the outset, was the Alberta government was involved in this story? I found the length of this film to be very good and the perfect length for a busy classroom. Be prepared to be proud of some of the newest Canadian workers anywhere in the nation (arguably these were the ones who had the most to lose by striking) because a very small group of primarily visible-minority workers launched this strike, walked the picket lines agitating for fair working conditions, and ultimately succeeded in winning the vote for a union at this plant -- against almost all the odds. It reminded me of the intriguing title of a book by Ted Chamberlin -- If This is Your Land, Where are Your Stories? which is described elsewhere as "a thoughtful and timely book which seeks to establish the condition for understanding to take place across the cultural divides." Don't miss this film! Cathy Vincent-Linderoos taught school for a decade in Ontario where teachers' unions are alive and well.